Southam manager Alex Baird was pulling no punches after his side were routed 10-0 at home by Hinckley AFC on Tuesday evening. Saints’ 2-2 draw with Lichfield City pointed to a change in fortunes for the Midland League Division One’s bottom team but a 4-0 defeat to Pershore Town and now a humbling by Hinckley has underlined the problems facing Baird. 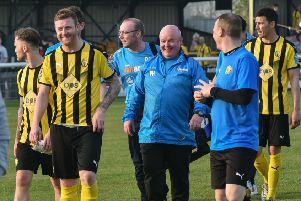 The beleaguered boss described Hinckley as “by far the best footballing side we have faced this season” but said many of Southam’s problems are of their own making. “We aren’t fit enough and we don’t do the simple things right,” said Baird. “The problem is we have a limited time with the players. We can’t work with the strikers, the midfield, the centre halves. “We have players missing at training because of work commitments or they can’t be bothered. “And because we don’t pay, we can’t just say you’re out like certain clubs can. “Even the likes of Racing Club Warwick, Bolehall and Littleton with limited budgets can get players but we’re feeding off scraps. Baird admitted budgetary constraints were making his job harder and the former West Didsbury & Chorlton defender said he was even considering making a comeback himself, despite an impending knee operation. “We’ve been working on initiatives but when the club are not seeing success it’s hard for the players to buy into it. “They don’t see the little things, people giving up their time, the groundsman and goalkeeping coach getting the pitch ready, the kit I bought out of my own money. “I don’t think some see or appreciate it. “You only get a limited time at semi-professional level and you have to treat every game as your last game. Saints travel to Heath Hayes tomorrow.